This is a project that is under construction. Some links in the notes may not work. Please report problems staff@ulaff.net . This document is your "hub". It contains hyperlinks that take you to videos on YouTube or, if you choose, downloaded versions of those videos. Start by downloading this document. "Right-click" the picture to the right to download. Click it to view the document. To install the notes with all activities download LAFF-2.0xM.zip and unzip it. In directory LAFF-2.0xM you will then find the PDF plus all the extra material (except for the videos). Note: the PDF may be out of date. You will want to download it separately! You can watch the videos on YouTube by clicking on "YouTube" in "Notes to LAFF With". However, if you have poor internet connectivity, you may want to instead download videos. First download and unzip LAFF-2.0xM.zip and unzip. In directory LAFF-2.0xM you will then find the PDF plus all the extra material (except for the videos). In directory LAFF-2.0xM you will find a subdirectory Videos . Download some or all of the zip files to the right into that directory, and then unzip. If you now click on in various places in the document LAFF-2.00M.pdf , the appropriate downloaded video will start. Please! These are large files and we pay according to the amount of data downloaded from the Amazon S3 account. 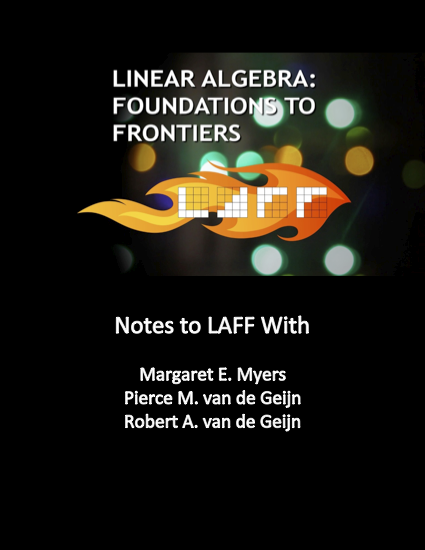 If you have not yet decided if you will pay for a copy of "Notes to LAFF With", then it would be considerate of you if you did not download the videos and for now watch the YouTube videos instead. Also, downloading multiple copies means we incur multiple charges. Notice that "srt" files (which contain timed transcripts) are also in the directories for each of the weeks. We will try to find some instructions on how to attach these to videos.